Our commitment is to deliver excellent, on-time technical solutions for your website and stretch into other technical arenas. We provide three basic web build plans to fit every goal and budget. Each plan can be easily extended to add more pages and/or features. Or, we can can give your existing website a facelift into the 21st Century through a Web Upgrade. We offer very reasonable maintenance options to help preserve your web build investment. They will keep your website "alive" and speaking your business. Along with making your content and updates, we also ensure the integrity of your build and provide off-computer backups. We have expertise in a widerange of technical areas. We offer an Electronic Newsletter which is an invaluable marketing tool. We have expertise in content authoring, including blog posts. We are SEO/SMM certified and can provide SEO analysis. We also provide other non-software services such as Mathematics and tutoring in other technical subjects. Tell us what you need and we will respond with an estimate for your project. 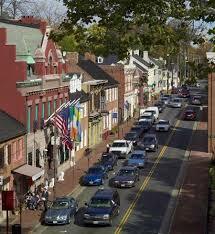 We specialize in servicing Leesburg, VA small businesses and will provide you with options in a timely manner. "We Can Build; We Can Market; We Can Maintain; We Can Go Beyond!" We have experience and certifications in Search Engine Optimization (SEO) and Social Media Marketing (SMM). We have helped companies increase markedly in size. Our unique philosophy is that every website is a blend of the artistic as well as the technical. So, you will see your custom web design masterpiece evolve from a web template through a careful eye for both aspects of the project until your website becomes your very own mirror image. As Four Tech Solutions, our commitment to you is to provide excellent technical solutions, delivered on-time when you need them, and at very reasonable pricing. We believe that your finished website will clearly portray your unique business branding, and be a point of pride for many years to come. As a technical services company, we specialize in Website Design / Website Build and Web Maintenance. Our focus has been primarily on small business web design; but we also have both medium-level and corporate work experience. Four Tech Solutions provides you the solution you need based on mutual discussion and careful analysis of your requirements. Our main services include: Web Design, including Web Upgrades; Web Maintenance; E-Mail Marketing Services (electronic Newsletter – eNewsletter), and also other specialized technical services — we even offer Math Tutoring for your “younger crowd”. Once your website is complete, we can go the extra mile and help you market your business. We have proven experience and certifications in Search Engine Optimization (SEO) and Social Media Marketing (SMM) to help you stay competitive in today’s marketplace. To ensure optimal load time, your site will also be performance optimized prior to going live. We have been working in the website arena since the turn of the century in 2000 and rode out the wave of the “dot-com’s”. Four Tech Solutions was started because of continued outcries for quality and marketable small business websites. Especially in times of economic downturn, business owners must shout their services and products even louder through a strong web presence. And in good times, websites can be improved and upgraded to keep that marketing edge. Our President comes with over 35 years working experience in a wide-range of software industry specialties and is Masters’ Degreed and patented. So, you can call on us for your “other” technical services as well. Please Contact Us for a FREE quote today! Four Tech Solutions will do our best to provide a response within 48 hours. Have a great day! Thank you for taking the time to read testimonials from our clients. We thank you for your kind referrals to others! Thank you Therese for the beautiful job you do and all your hard work. 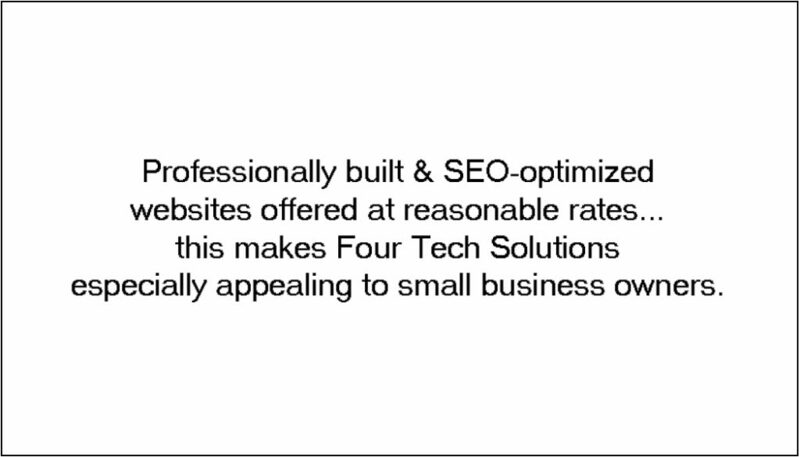 Four Tech Solutions is committed to providing you excellent, on-time technical solutions. 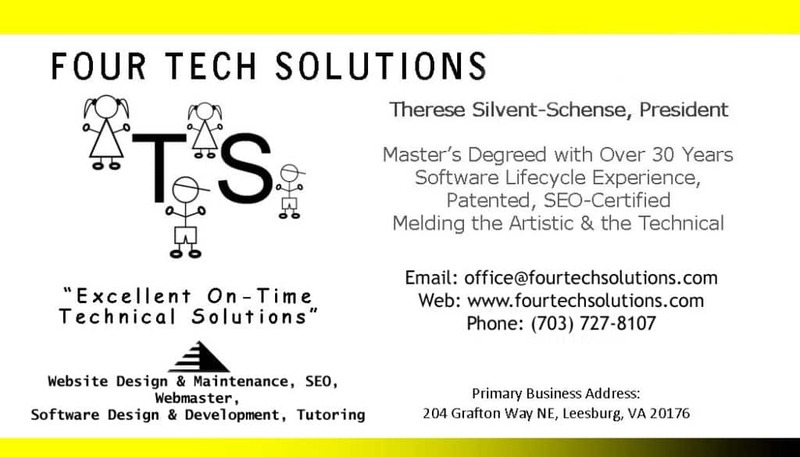 We specialize in web design and web maintenance and as a webmaster for Leesburg VA / Loudoun County small businesses, we help you with marketing through our experience in SEO/SMM. Welcome to our web upgrade - released in June, 2015. Hope you enjoy our refreshing new look and feel! Book now for special build discounts.